Price Hill Will is a secular nonprofit community organization that also involves heavy community input and works to improve the neighborhood with three main programs: housing redevelopment, community organizing and economic development. 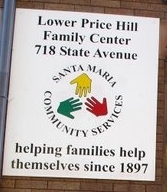 Santa Maria Community Services, a nonprofit organization that has been in operation for over a century, offers an array of programs designed to strengthen families, assist them with challenges and empower them within their community. BLOC Ministries, a Christian-based nonprofit organization, is also very active within Price Hill, with a focus on high school teens and their parents. The BLOC works in schools, providing resources such as tutoring, counseling, mentoring, after-school programs, and in-school student-lead bible studies and prayer groups. The Enright Ridge Urban Eco-Village is composed of 90 households working to foster a sustainable urban neighborhood, with an aim of helping to preserve the planet through social, economic and healthy lifestyles. Situated atop one of the highest of Cincinnati's historic hills, Price Hill is a community of Old World charm. One finds breathtaking Victorian era homes and renaissance architecture in its churches and public buildings. 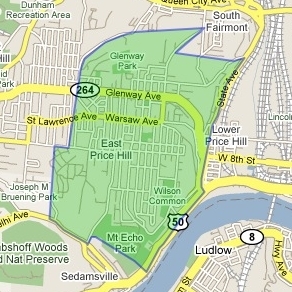 But what is it that makes Price Hill the Emerald City of Cincinnati? The biggest factor could be Enright Ridge Urban Eco-Village, a sustainable neighborhood in East Price Hill focused on preserving the planet through initiatives promoting healthy, social and economic lifestyles.